This week we did not get a great deal of variety, but we made up for that with quantity. 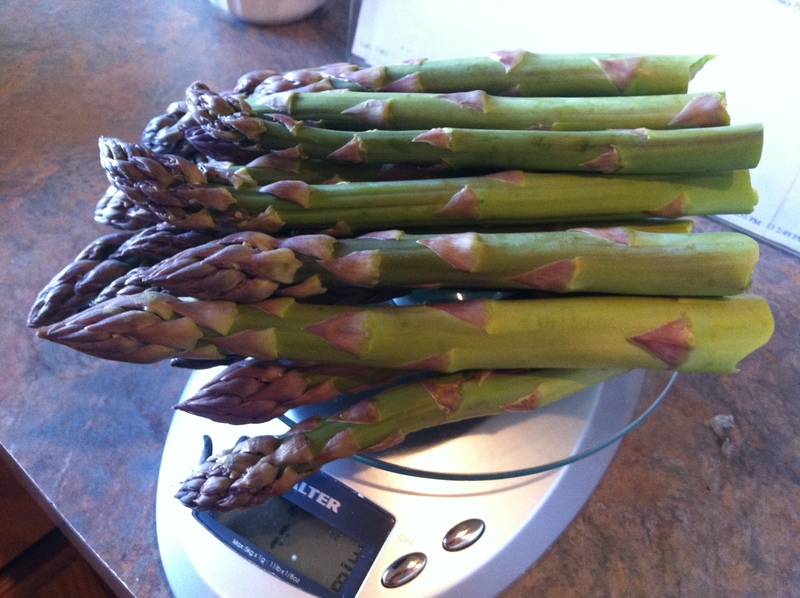 5 more lbs of asparagus. My daughter pointed out there are no huge stalks in this shipment. Those big guys last week must have been the first harvest, over-achievers. We haven’t used up all of last week’s asparagus. But have no fear! We have lots of ways to consume this member of the lily family. To prepare asparagus, I always break the stalks naturally by hand. This way I never end up with woody, stringy stalks that I used to get sometimes when I trimmed them with a knife. The ends go into the compost, so I don’t feel guilty about not using ALL the asparagus. Simple preparations are easy with asparagus. Luckily, they taste like a treat and no one ever feels cheated because you steamed your asparagus. Steamed: I steam my asparagus until just fork tender, and if not serving immediately, I remove it from the steamer to a bowl filled with ice, so it stops cooking and doesn’t get mushy. Sometimes it is chilled if I haven’t timed the rest of dinner very well. Grilled: Toss the asparagus in olive oil and sprinkle with salt. We grill it over medium heat until nicely charred and crisp tender. Mmmm. It is hard to have any left to eat with dinner because we tend to grab it right off the grill. I also use asparagus as a vegetable in other dishes. My favorite is risotto. This week I tried a microwave risotto recipe that turned out surprisingly well. We also used asparagus as one of a number of vegetables (including the last of my purple sprouted broccoli) in a yummy chicken pot pie that I will post shortly. Pickled – I haven’t done this yet, but will try it this weekend if I get a chance. Luckily, asparagus doesn’t go bad quickly, so If I don’t get to it this weekend, it should be okay next weekend. I wonder if we might get asparagus 3 weeks in a row? I had read earlier this year that you could successfully make risotto out of rice other than arborio rice. Since we bought a 20lb. bag of brown rice at Costco, that was what I decided to use. This recipe was modeled on the microwave asparagus and lemon risotto recipe in the May issue of Cooking Light, but it had to be adjusted due to the fact that I was messing with what type of rice I was using. Arborio is apparently a medium grain rice, and my bag of brown rice says it is a short grain rice. I admit I am not fully educated about the finer details of various types of rice, but it did affect my cooking time significantly. Combine the first 4 ingredients (through olive oil) in a 2 quart microwave safe bowl and microwave on high for 3 minutes. Add rice and combine, then microwave on high for 3 minutes. Add chicken stock and wine, combine then microwave on high for 4 minutes. After 4 minutes, stir stock for 30 seconds, the microwave on high for 4 minutes. Repeat this process until liquid has been absorbed. For arborio rice, the recipe said it should take a total of 16 minutes. For my brown rice it took significantly longer, up to an additional 20 minutes. Add asparagus and microwave on high for 2 minutes. Stir in remaining ingredients, saving some cheese for garnish. Because I used brown rice, I didn’t save much time by making the risotto in the microwave. But it was a fun experiment, it tasted right, and there were a lot less dirty dishes than making risotto the traditional way. 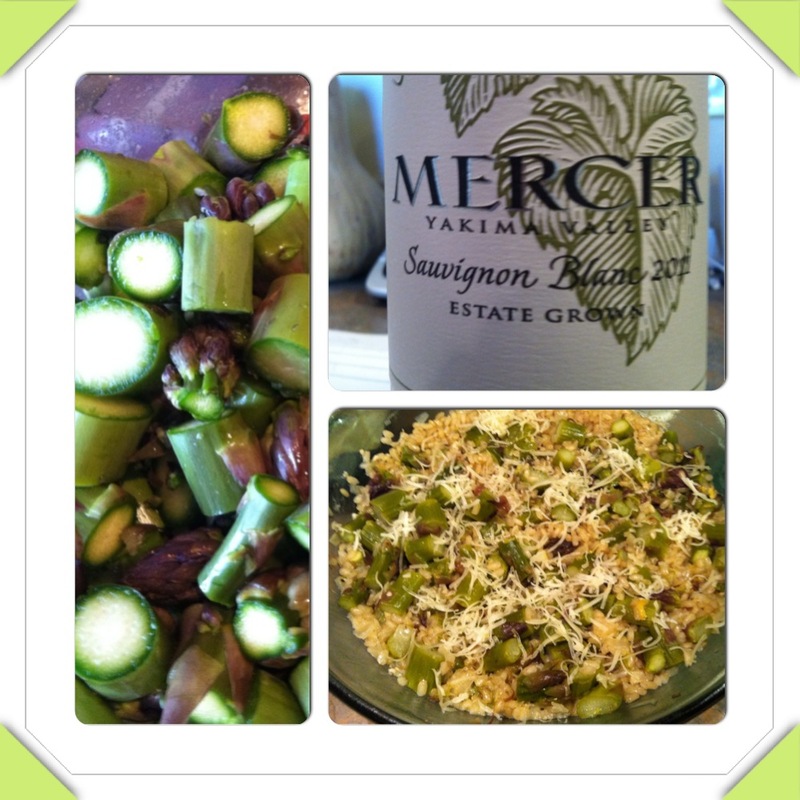 This entry was posted in Recipes and tagged Asparagus, brown rice, CSA, grilled asparagus, microwave cooking, onion, pickled asparagus, rice, risotto, shallots, steamed asparagus. Bookmark the permalink. I walk the dog past a great backyard garden, and that gardener’s asparagus has barely peeped out of the ground. I’m holding out hope for asparagus in the farm share when it starts next month. I’ve composted the snapped ends (the composting pigs turn up their noses) but I’m curious about using them in a veggie stock. I’ll investigate. 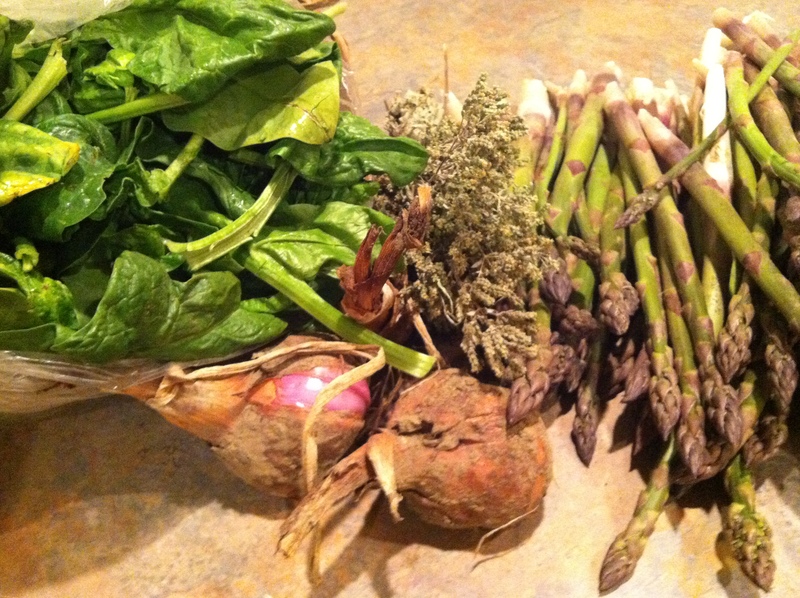 Thanks for so many great suggestions for asparagus! I just love asparagus. I want to try planting some this year. I usually keep mine in the fridge standing upright in a glass of water. It really extends the shelf life. I like the idea of a microwave risotto. Thanks for sharing.